Ecocentric Mom – April 2017 Spoiler + 40% Off Your First Box! Now through 3/24, use coupon code EARTH40 to save 40% off your first month of an Ecocentric Mom box! Each of our box types this month include products from the adorable Itzy Ritzy line of stylish (eco-friendly) accessories for moms and babies. Moms are always carrying plenty of gear; whether you’re toting pacis & diapers, snacks or makeup, Itzy Ritzy bags are a cute, earth friendly way to do so. 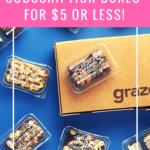 Full details: Offer valid for new subscribers on monthly self subscriptions, Limit 1 per customer.